The Hermitage is gone from Civic Square, but occupying the slot and hoping to pick up the Legislative Assembly lunch business is Mr Weis. The emphasis is on duck and dumplings, two of my favourite things. Goosepig and I went in last night to get a bite before a show at the Canberra Theatre. 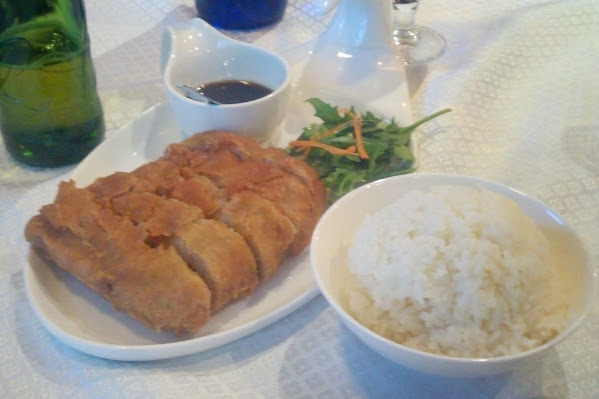 We ordered two entrees, lamb skewers and pork ribs, and a crispy duck main to share (pictured). The service is friendly and trying hard, but when you’re aiming at the high end chances are your cousin doesn’t have the skills of a top waitress. They’ve only been open a month however, asking around $25 per dish, paying over the odds for gun wait staff is really a good idea. Importantly for a pre-theatre feed the food came quickly. Arriving at 6.55 we were out by 7.30. The food is modern Chinese, in the Chairman Yip sort of territory. The flavours were novel, and to me at least delicious (Goosepig had saved herself for the duck only to decide she didn’t like the batter, which had an unusually thick texture, and was not well pleased). With two beers each (Coopers Pilsner served in place of the Coopers Pale on the menu) two entrees and a shared main we were up for $75. So the food is great, and at this price importantly novel, the service is scratchy. For the right occasion I’d give it another go.